Up your typography game in Apple, Microsoft, Adobe and Quark apps. Fancy typography doesn’t require expensive software. Thanks to the OpenType font format, the newest versions of everyday software (and the pro stuff) can tap into a multitude of alternate character designs if you know where to look. 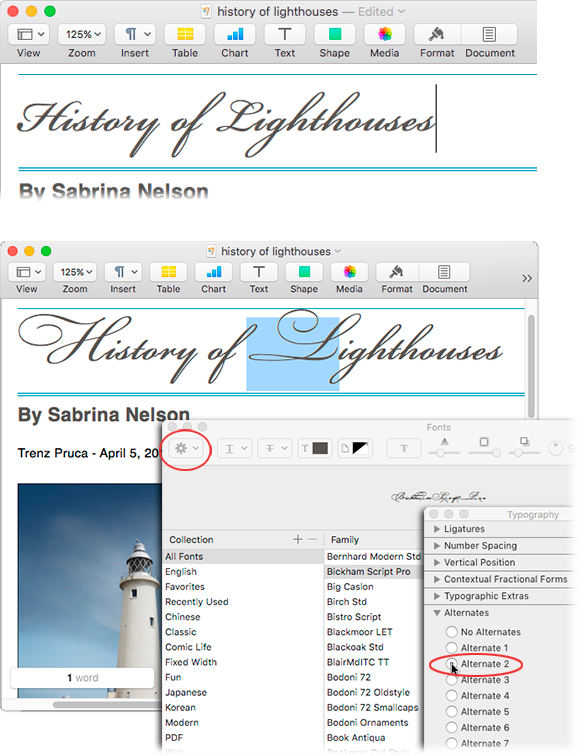 In this column, you’ll learn to use a variety of applications to add a special flourish to an important letter in a word—say, the first or last letter of a name—or to change the appearance of any amount of text. It’s a wonderful way to enliven an invitation, greeting card, inspirational graphic, logo, headlines, stationery, resume, and so on. Released in 2000, the OpenType font format was intended to replace TrueType and PostScript font formats, and it dramatically extended the potential scope and intelligence of fonts. Soon font developers began releasing advanced OpenType fonts—most have Pro in their name—that contain thousands of characters (correctly called glyphs). Over the years, creative and ambitious font developers added multiple versions of some characters—say, different versions of an “f” as shown above—enabling you to customize text in special ways. That said, however fun replacing one character with an alternate glyph can be, it gets tedious because advanced OpenType fonts often include lots of alternates for some characters and zilch for others. Also, some alternates simply don’t look good when placed next to specific other characters. To aid you in locating alternate characters that look good together, some advanced OpenType fonts include stylistic sets, specific combinations of alternate characters chosen by the font designer. Some fonts also include more typographic substitutions in the form of additional alternate glyph sets named contextual alternates, swash alternates, and titling alternates. 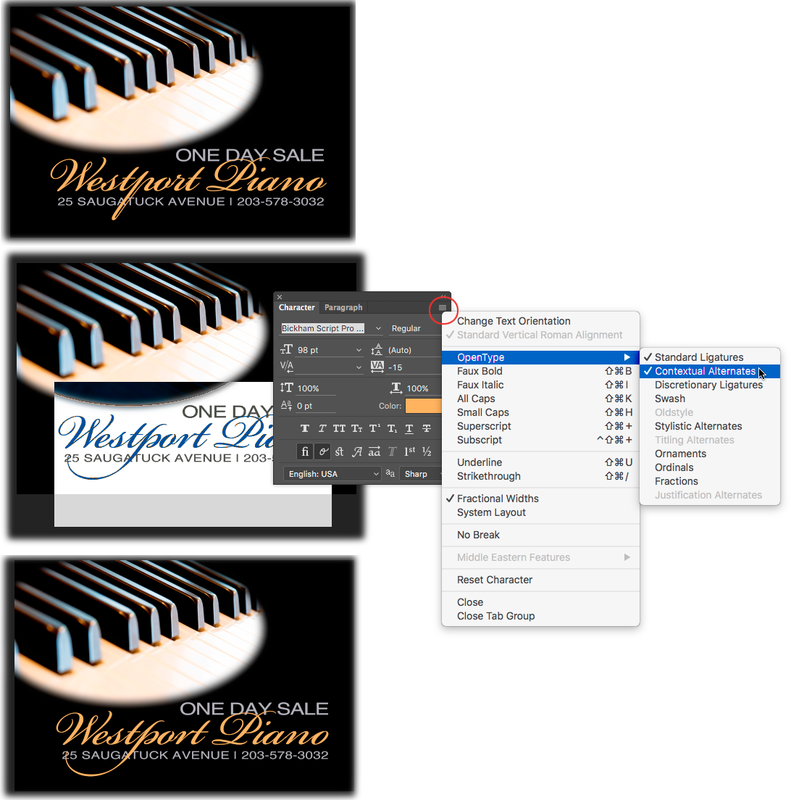 Initially, you needed pro-level software to access advanced OpenType features but not anymore. To swap glyphs, you have to start with an advanced OpenType font so the biggest challenge may be figuring out which of your installed fonts qualify. If you bought the font, then you’ll know; however, some are automatically installed with Adobe applications. If your Mac has a font with Pro in its name, it’s probably an advanced OpenType font (in Adobe apps, you can find them by entering “pro” into the font name field). If you don’t have any, you can buy them from Adobe, FontShop, P22 Type Foundry, Sudtipos (the maker of your author’s favorite, Adios Script Pro) and other font developers. If you subscribe to Adobe’s Creative Cloud, you have free access to advanced OpenType fonts through TypeKit. However, to try out the features in this column without spending money, download Gabriola, a free advanced OpenType font from TheFonty.com. The way you access advanced OpenType features depends on the application. However, the first step is to highlight some text and then apply an advanced OpenType font to it. Next, highlight the character(s) or word(s) that you want to swap for something else. In Apple applications (TextEdit, Pages, Keynote, iBooks Author, etc.) choose Format > Font > Show Fonts or press Command-T. Click the gear menu (circled) and choose Typography. In the resulting panel, click the triangle next to the Alternates section and then turn on any of the alternates in the list to change the highlighted text. 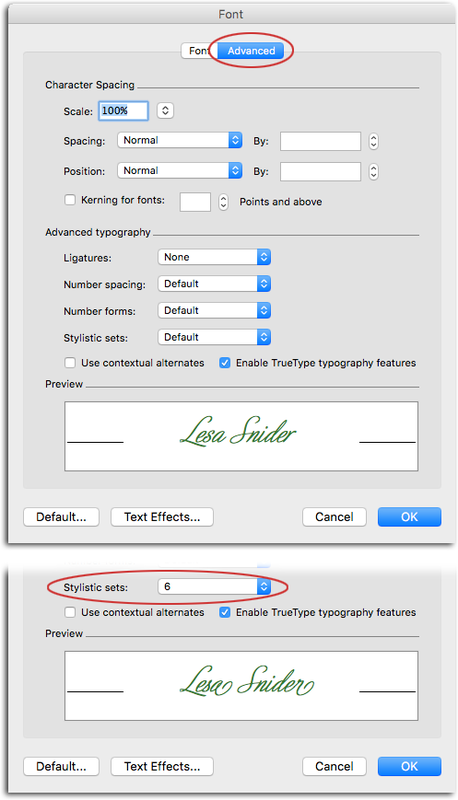 If the font also includes stylistic sets (not all of them do) you’ll see a section named Alternative Stylistic Sets. 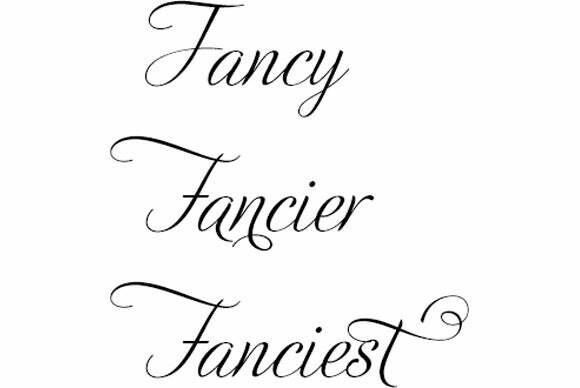 If it includes contextual alternates, there’ll be a section for that, too (the latter also includes swash alternates that can add some seriously ornamental swashes to your text). Note the difference between the H and the L using regular Bickham Script Pro (top) vs. the fancier versions using glyphs in Alternate 2 (bottom). 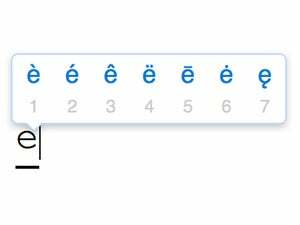 You can’t access alternate glyphs in Microsoft Word, but you can access stylistic sets and contextual alternates in Word 2010 and higher. To do that, choose Format > Font and in the dialog box that opens, click Advanced and then click the Stylistic Sets menu. The switch for contextual alternates lies beneath that menu. Unfortunately, Word doesn’t indicate which sets are available for your font, so you have to try them all to find one that works. Adios Script Pro was used here; notice the difference in the “a” and “r” in set 6. To access alternate glyphs in Adobe InDesign or Illustrator, choose Window > Type & Tables > Glyphs; in Photoshop, choose Window > Glyphs. In the panel that opens, click the Show menu and choose Alternates for Selection. Double-click an alternate’s thumbnail to swap them out. Here you can see the alternate glyphs for an “F” in Adios Script Pro in InDesign. 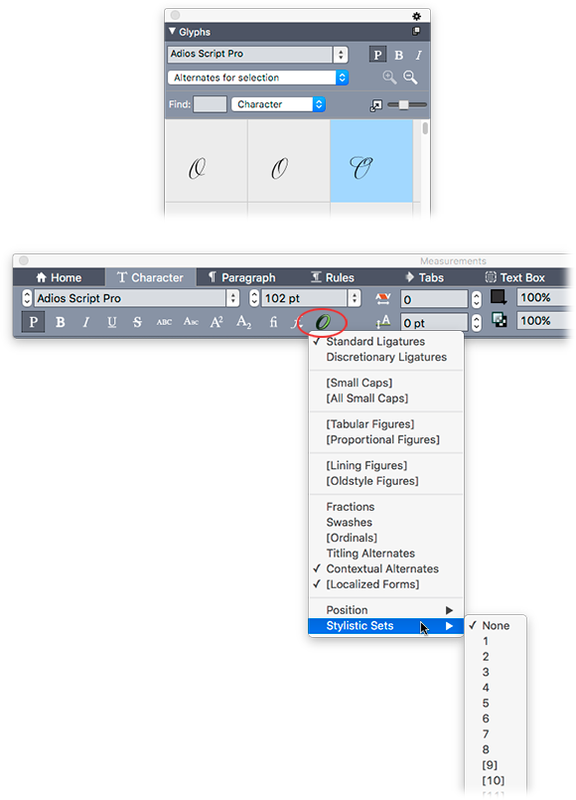 To access stylistic sets in InDesign, choose Window > Type & Tables > Character. Click the fly-out menu at the panel’s upper right, choose OpenType > Stylistic Sets and then pick one of the non-bracketed sets (those with brackets aren’t available in the current font). To apply a different set, deselect the first one and then pick a different one (a frustratingly tedious procedure)—you can apply multiple stylistic sets, sometimes a character or two will change but sometimes not. InDesign’s OpenType menu also provides options for swash, contextual alternates and titling alternates. In Adobe applications, enabling each alternate individually provides different combinations of characters, as does enabling more than one at the same time. Photoshop and Illustrator lack stylistic sets, but they have contextual, stylistic, and titling alternates, which are worth exploring. To find them in Photoshop, choose Window > Character, click the panel’s fly-out menu, and choose OpenType to reveal a list of options. 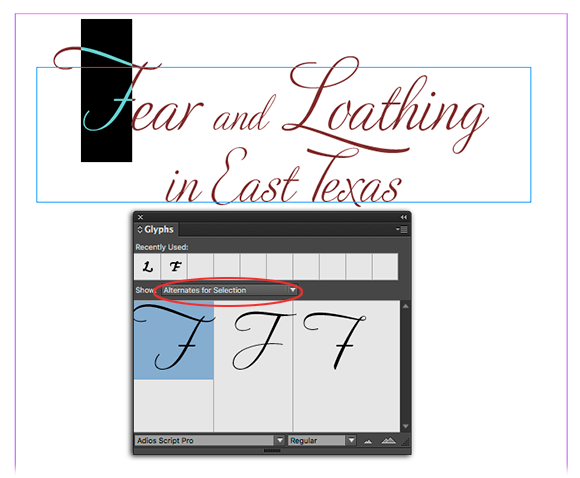 In Illustrator, choose Window > Type > OpenType and then click the panel’s fly-out menu to get a list. Contextual Alternates are worth exploring, as you can see in this before (top) and after (bottom) in Photoshop. The flourish in the lowercase “p” greatly improves the ad. To access alternate glyphs in QuarkXPress, choose Window > Glyphs and in the panel that opens, choose Alternates for selection from the second menu from the top. Stylistic sets aren’t available yet, but they will be in QuarkXPress 2016 (set to release in the second quarter of 2016). You’ll be able to find them in the Character tab of the Measurements palette—click the green “O” to see them. Alternates glyphs have been available for awhile in QuarkXPress (top) though stylistic sets are coming in QuarkXPress 2016 (bottom). As you can see, advanced OpenType font features can set your text apart from all the rest. Until next time, may the creative force be with you all!